It was a beautiful Saturday evening on the San Juan Islands when Captain Gabe, and naturalist, Jordan and I along with the joyful guests set out to find some whales. We had been with two groups of transients traveling together earlier that day and watched them split up into three different subgroups. We had gotten a call from a boat up North shortly before departing telling us one subgroup was hanging around Sucia Island. I was so excited to go that way because Sucia is one of my favorite islands having the coolest rock formation and interesting fossils, such as dinosaur fossils! As we were headed up San Juan channel and about to turn into President’s channel, we spotted a bald eagle perched up on Crane Island; this eagle was massive (guessing it was a female because they are bigger than the males). As we headed up the channel, the PNW decided to show its true colors giving us rain on the port side and sunshine on the starboard side, creating the most beautiful full rainbow in front of Orcas Island. This was truly a magical sight and I think, the guests and myself, would have been content just seeing the rainbow this evening. Of course, the Salish Sea had so much more in store for us, President’s channel was full of porpoises coming up for air not too far from our boat and everyone was able to get a good look at their dorsals. The water was flat and glassy and this made it so easy to spot any animals on the water. As we rounded around Waldron, we could see Patos Island and its beautiful lighthouse from a distance. We received another call from a whale watching boat and were told that they had gone into Echo Bay! 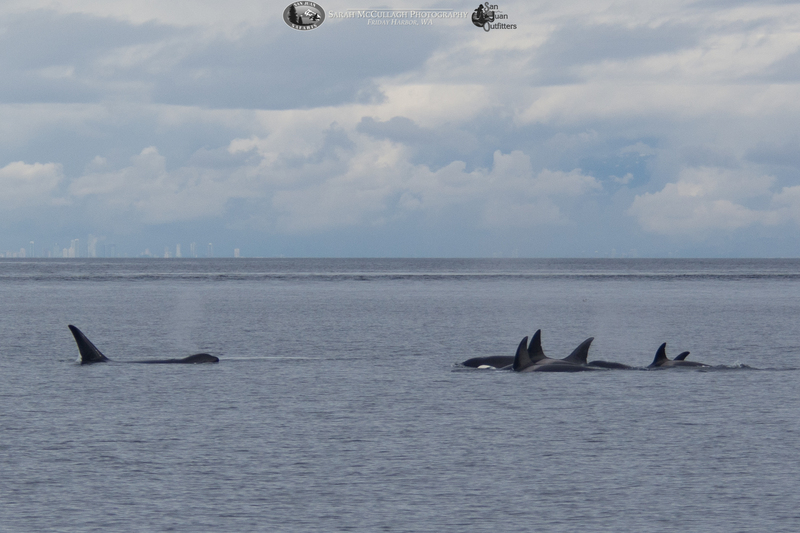 “How cool!,” I thought, “I wonder if their exhalations are more loudly heard in the bay?.” As we tried to catch up to them, they seemed to be moving fast but we were able to find them towards the north side of Sucia and stayed with the a group of transient orca females and a couple of calves for the rest of the evening. We were able to turn our motor off in order to hear them breathing, which never fails to be a surreal experience to all. A guest happened to look the opposite way and spot a harbor seal scared for its life. As we pointed the guests to the seal, the whales started to move towards it and all of the sudden they disappeared into the dark green depths. When they came up again they rose right where the harbor seal was and were creating lots of splashing..Who knows what became of that seal? As they headed towards Patos hugging the coast, we followed behind and were able to see a breath taking sight when out of nowhere they came up a couple of feet from our boat and position the Patos lighthouse as the most picture perfect background. The sun was starting to set and we began to move back south, but the trip was not over! On the way down we spotted two adult humpbacks who surfaced near us a couple of times and one of them even showed us their fluke! We were already an hour out from the harbor so we hurried back down the channel and of course this was a treat too; the sun was setting and giving the ocean a bright yellow band and the trees were lit up.